Welcome to our showing, this time featuring seven works from the Russian lacquer box artist . At 44 years old, Smirnova has reached the highest level in her craft, has been a participant in numerous exhibitions, and is a member of the prestigious Union of Artists. Except for Peter the Great, all the boxes below were done in 2010 and represent some of her best work to date. We are also very pleased to have Smirnova in person at our gallery until the New Year and invite all to come in and visit with her during this opportune time. 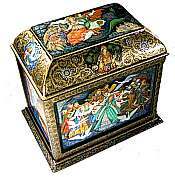 We guarantee that during your visit you will see some of the most stunning works available in the world of Russian lacquer boxes. And you can also see first hand how a top lacquer box artist works to create this miniature art form. p.s. We wanted to bring you works by her sister Tanya and son Arsenij in this showing, but decided to show their works on this coming Monday. Page 1 of 1 total page with 5 results. 6.75" x 5.50" x 1.25"
7.75" x 6.50" x 1.50"
5.50" x 6.75" x 1.75"